"I'm a Cowboy....On a Steel Horse I Ride..." Think about the heads you'll turn wearing this Bon Jovi styled jacket in Distressed Brown Buffalo leathers overlaying the black leather body. Features braided front and rear accents above well planned fringed trim. 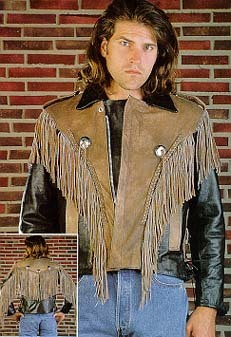 Matching fringe also travels down the sleeves to the adjustable zippers. Nickle hardware includes slotted conchos on the chest. (Conchos are upgradable to Montana Silver for additional fee.) Hand pockets are covered by leather flaps for style. Inside pocket. Side laced for more comfort when riding and to show those lean abs! No Belt. Removable Zip Out liner. Epaulettes to hold your gloves or other accessories as needed. Clean and condition these leathers with leather balm. You may use snow seal, or mink oil to weather proof . CAUTION: all conditioners will darken the color of distressed leather until they dry. Expect the variations of the distressing process to become more pronounced after cleaning and conditioning. Darkening of the leather on the neck or the sleeves from body oils is a natural occurance as your body oils will keep the leather full of natural conditioners where contact is direct. Neutral cream or wax polish can be used to enhance the distressed color while a black polish or cream will work on the Black leather. Sizing on these coats tends to be small. Order a size larger than your chest measurement for a snug fit and two sizes larger for a more relaxed fit. Style 403 is made of select Buffalo hides. Buffalo is a variable grain leather that will usually have more natural scars and blemishes due to the wild nature of the beast. Panels of the coat may have slight variation in appearance...more of a distressed or retro look. Buffalo breaks in soft and fast.